Hi and welcome to JT Hughes Hyundai here in Shrewsbury. My name's Rob. 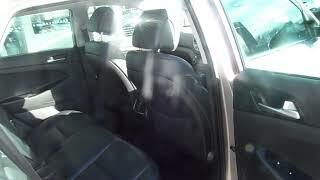 Just going to take you around this used Hyundai Tucson. This is the 2-litre diesel automatic 4-wheel drive Premium on the 65-plate, done just over 13,000 miles. As you can see, it looks absolutely stunning in the White Sand paintwork. So Premium, very well-equipped. You have your front parking sensors, LED daytime running lights, autonomous braking, alloy wheels, body-coloured mirrors with indicators in them and door handles. Around the back, you've got your rear parking sensors and parking camera. And we'll have a look inside the good-size boot. As you can see, flat loading area, Tonneau cover there to keep everything nicely out of sight, 60/40 split rear seats for any larger items. You've got a courtesy light and power socket in the corner there. Under the boot floor there, you've got your full-size alloy spare wheel. Now, the Tucson's a great family car. This is the 2-litre diesel 4-wheel drive. But it's intelligent 4-wheel drive, so it'll be front wheel drive until it needs the 4-wheel drive, which it will look after automatically. In the back, as you can see, very roomy indeed, loads of leg and headroom. You've got three full seatbelts across the back, ISOFIX fittings on the two outer seats, full leather upholstery, centre armrest there with a couple of cupholders, ventilation there for the rear seat passengers. We've got pockets on the back of the front seats for additional storage. The two outer seats in the back are also heated. And again, we have electric windows in the rear. Now, if we move into the front, again, the front seats, nicely shaped and supportive, electrical adjustments on both. Electric lumbar support on the driver's seat. You've got your centre armrest there with storage inside, a couple of cupholders. You've got the automatic gear selector there together with the electronic parking handbrake and the auto hold facility. And you've also got a button there where you can engage the 4-wheel drive system if you want. USB, auxiliary input, a couple of power sockets. You've got the heated front seat controls, dual climate control, satellite navigation, DAB radio, rear parking camera, auto-dimming rear-view mirror. And then, on and around your steering wheel, you've got your cruise control speed limiter. You've got your trip computer buttons, audio controls, Bluetooth for your phone. So everything's really nicely at hand. Auto lights, auto wipers, all standard, as is Lane Departure, Lane Assist, Blindspot Detection, rear cross traffic alert, and I've already mentioned the autonomous braking system, which is all standard on this vehicle. 13,628 miles, so as we see, extremely low miles. And in the driver's armrest, you've got controls for all the electric windows and the electrically adjustable and retractable door mirrors. Now, this car will come with the remainder of the five-year unlimited mileage warranty from the date of first registration, and that also gives you AA Five Star cover, that's your Homestart to relay recovery, again for the remainder of that warranty period. If you'd like any further information or if you'd like to arrange a test drive, then please contact JT Hughes Hyundai Shrewsbury, on 01743 450888. Watch woman from Shrewsbury take on a man in a parking challenge and turn into a speed demon.